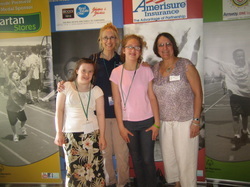 Remember Special Olympics when filing in your Michigan Tax Forms. Check the box to donate $1 to this most awesome cause. 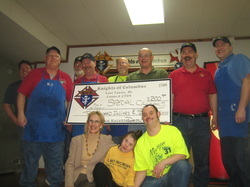 Knights of Columbus support Special Olympics Area 31. The Tawas Area Knights of Columbus generously donated to Special Olympics Area 31 from the proceeds of their popular Friday evening Fish Fry on March 21, 2014. Pictured is the K of C crew and officers, Special Olympics athletes and Area Director. Shoreline Players Hosts Special Olympics Talent Show. Area 31 Athletes were lavishly hosted by the Shoreline Players with professional Emcee Mark Lee, Director Sue Miller, DJ J.D. Hock, the multi-talented Crystal Peters, Eric and Shauna. The LETR - Law Enforcement Torch Run - in the Tawases on September 11, 2013. Special Olympics Michigan, local Law Enforcement and Area 31 athletes came together to participate in the Tawases contribution to the Statewide Law Enforcement Torch Run. 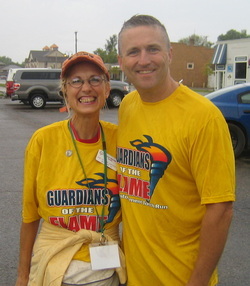 Here Special Olympics Area Director Vicki Hopcroft with West Branch State Trooper LETR Coordinator Gregg Kopkau. Special Olympics. Coaching Men's Basketball at the State Competition. It was my privilege to assistant-coach these awesome guys at the 2013 State Basketball Finals where they took a Bronze Medal. Area 31 Wildcats B rock! The Area 31 Lady Wildcats A have been the District 1 State Champs for four years running. We're always looking for volunteers, and new athletes are always welcome! Message SOMI - Area 31 on Facebook. Ed Fischer and I represented Area 31 as Coach and Volunteer of the Year. Here I'm pictured with my banquet guests Natalie Hopcroft and Lena Lee, and our Northern Michigan Field Service Manager Belinda Laughlin. Division One. Women's State Champions. Area 31 excels in women's basketball, having won First Place four years in a row. Want to get involved? Volunteer. Cheer. Donate. Like us on Facebook.